Welcome Back! 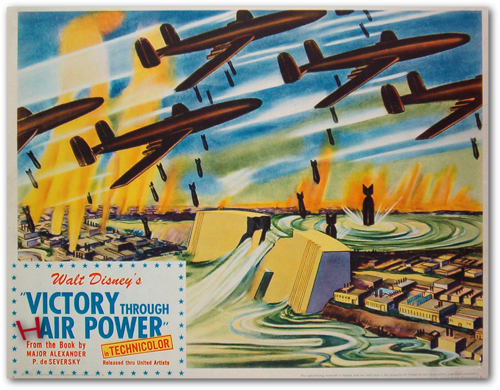 We begin with another Disney film, Victory through Air Power. (This film isn’t part of their animated canon though). Victory through Air Power is an animated documentary. It was produced by Walt Disney and released by United Artists. It was released on July 17, 1943 in the United States. Victory through Air Power was nominated for the Academy Award for Best Music Score of a Dramatic or Comedy Picture. The story direction was written by Perce Pearce. The story adaption is by T. Hee (Pinocchio, Fantasia, Make Mine Music), Erdman Penner (Pinocchio, Fantasia, Make Mine Music, Melody Time-Sleeping Beauty), William Cottrell (Snow White, Pinocchio, Saludos Amigos, The Three Caballeros, Melody Time, Alice in Wonderland, Peter Pan), James Brodero (Fantasia, Dumbo, Saludos Amigos-Make Mine Music), George Stallings (Fantasia-Bambi), and Jose Rodriguez. The main distributor RKO Radio Pictures refused to release the film, so Disney had the company that distributed their shorts, United Artists, distribute this film. It was the first and only time another studio distributed one of their movies. The budget was 788,000 and the box office was 799,000. 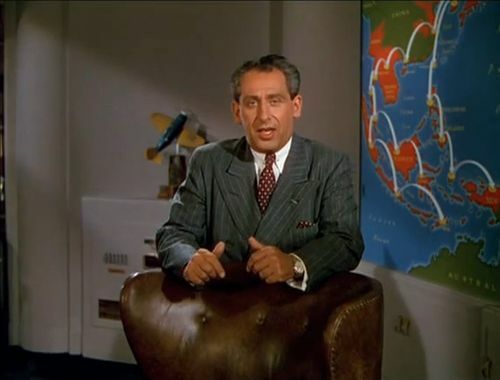 In 1941, Disney films were basically propaganda films for the United States government. Most films were created for training purposes, but Victory through Air Power were created to catch the government’s attention and to build morale. Both Winston Churchill and Franklin Roosevelt agreed that Disney knew what he was doing. In one scene, there’s a fictional bomb destroying a German submarine pen. This directly inspired the British to develop a real rocket bomb to attack targets. The weapon became known as the Disney bomb, and saw limited use before the war ended. After, its release there was no theatrical releases for 60 years. The reason is most likely because it is seen as propaganda and may be offensive to the Germans and Japanese people. In 2004, it was released on Disney’s Wartime Collection in the Walt Disney Treasures DVD series. 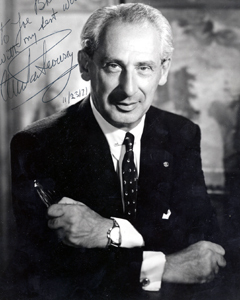 It is based on the book “Victory through Air Power” by Alexander P. Seversky. 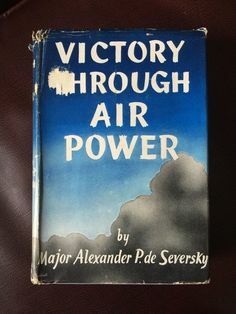 Victory through Air Power was published in 1942. Victory through Power was also nominated for an Academy Award. I have seen half of this film before. I remember being really bored. So, first we start off with some news clips about the war and Billy Mitchell’s pleads. Then, it gives a dedication to him. Then, the narrator talks about airplanes, the history behind them, how they work, and other similar things. Then we get a discussion from the author. Then it talks and shows about winning in Britain, along with Hitler’s plans. The movie discusses aviation. Then the end, is an epic battle between the bald eagle and an octopus, with a sword. The eagle won. The movie is very informative. It has a lot of information that I didn’t know. When, schools discuss World War 2, I think this would be a good idea to show them. The other documentaries are really really boring, so this might make children want to learn more. The battle at the end was really interesting though. I think the bald eagle signifies the United States while the octopus signifies Japan maybe, and since the bald eagle won, that means the United States beat Japan. Victory through Air Power is black and white, which I know is a part of history, but I hate black and white films. Along, with silent films, I try really hard, but I find them incredibly boring, and it’s really difficult for me to pay attention. Like, I had to put a lot of effort just to stay focused and watch this film. There were still times that I stopped paying attention. The movie I find really boring, but most documentaries are boring. It could also be the subject matter, and maybe not necessarily the movie. I have no interest in aviation. Next, up is another Disney movie is The Three Caballeros. It is the sequel to Saludos Amigos and is a part of their animated canon. It was released in 1944. The Three Caballeros brings back Donald, Jose, and adds the new member Panchito to the group. The Three Caballeros is another package film. I don’t remember much of the movie to be honest. To be honest, I so far skipped watching it, because the movie is only partly animated. Should I ever get around to do an overview of live-action and animation mix movies, I guess I would have to discuss it. Though in general, I actually appreciate Disney’s wartime cartoons. Yes, it’s propaganda, but it feels less hateful than the usual propaganda and more interested in exploring the mechanism behind this war. Honestly, if you can avoid it, I’d avoid it lol. Its pretty boring. I don’t think I’ve ever seen any of Disney’s war cartoons, but I’ve heard about them. I think at least one of them was nominated/won an Oscar. To be honest, I’ve never really been sure what propoganda is, except people make it out to be a bad thing. But, I didn’t see anything bad lol Yea it was more of a history lesson. I think I’ve watched this one? I can’t remember. Ummm…. It has planes and a lot of talking lol I just watched it yesterday, but I don’t really remember anything about it lol.